Hey there! I'm so glad you could stop by. If you've ordered, tasted, enjoyed, admired, etc one of my tasty baked creations, please feel free to leave a comment/testimonial about it! Thank you!! I can’t tell you what a special treat it is every night (for 10+ years) to look forward to the morning knowing I will have my date bars. I’m eating them now with two scoops of ricotta and walnuts! Soooooooooooo good. Alaine makes a lot of healthy tasty treats but her strawberry rhubarb pies have always been my personal favorite! MMMM! 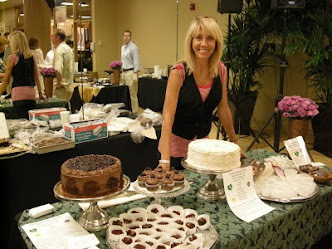 I first met Alaine of Alaine's Bakery when she had a booth at the Hollywood Farmers Market around 13 years ago. I was new to to the whole concept of guilt-free desserts. I soon found that her treats were delicious and healthy and I became a regular customer of her pies. Her baked goods are so healthy they can be eaten for breakfast. I cannot say that of any other brand of dessert I know of. She's consistent in the quality of her products and I highly recommend to anyone who has not tried her desserts to go ahead and enjoy guilt-free without sacrificing taste. My vice? DESSERT! And nothing is more depressing than standing in a grocery store looking at dessert that i can't eat. Alaine has mastered the art of healthy, delicious, and beautiful desserts that are far from depressing, turning my vice into virtue! Thanks for the delicious treat--it was so good! Your banana chocolate cake should be listed under the 7 deadly sins, but wait!! it is healthy for you! C'est impossible!!! Your pastries should be called "a religious experience" for after taking a bit of your pastries we utter the words, "oh, my god!!!" They are tres magnifique! This is actually dessert that we should all eat more of! My favorites are the fruit tart, German chocolate cake, and the chocolate chip cookies. YumYumYum! Alaine, I’m so thrilled that you have moved to Tucson--because this means that your incredible edible creations are available here locally. Not only are they works of art and phenomenally delicious, but it seems too good to be true that they are actually healthy, too… The vegan chocolate cherry cake I enjoyed on Sunday was totally and blissfully delicious. You must have some magic running through your veins to be able to concoct these culinary delights that are actually GOOD for us. I feel very blessed to have discovered you! 'Laine's cake how I love! sound and sight is like the spring. I ordered a coconut macaroon cake and Alaine sent it to Upstate NY from Tucson. It arrived in safely and was delicious. Thanks so much Alaine! The chocolate cake Alaine made for my friend's memorial was stupendous! Delicious, yummy and healthy !! It had everything I requested. My 7 year old granddaughter still talks about how good it was. The chocolate vegan cake was delicious Everyone in the salon loved it and by the end of the day it was gone. You made my birthday that much more special and I can't wait to order another one. As all who have tried your products know, yours are the best! What I appreciate so much is your willingness to accomodate my dietary requests. And what really impresses me is that I can absolutely count on your doing what you say, on time....your word is good as gold. We had dinner at Alaine & Ted's last night and it was amazing. We were spoiled! Simply an amazing and sumptuous repast--and to top it off a decadent(though entirely vegan and healthy) chocolate cake to top off the dinner. OMG! We will definitely be back Alaine! Ted & Barbee Carwford, OV, Az. Had a great Chinese Dinner to celebrate the New Year. Dessert was fabulous. We all enjoyed ourselves, especially my granddaughter who was able to go out and feed the horses some carrots. I met Alaine over the weekend at the Tanque Verde Antique Fair where she had a wide selection of baked goods. Having to be GF can sometimes be hard when we're out and I'm hungry because being "glutened" is rather unenjoyable. I had the cranberry muffin and it was the BEST GF muffin I've ever had. We talked with Alaine about her ingredients and had a really great time learning all about their company. I look forward to being a repeat customer! We ordered the banana chocolate chip cake for a birthday party and it was absolutely fantastic! Thanks so much, Alaine, for a scrumptious dessert that made the evening extra special. Thank you for the adorable smash cakes you made for my twin boys' 1st birthday. They went bonkers over them, and they turned out so beautiful! It's amazing how you can make dairy-free, vegan, nut-free, gluten-free - and so natural - taste so, so good!! Thank you very much for sharing the testimonials that will help me to have best information related with clients reviews for your website. This is an amazing blog! Do keep up the good work. By the way, if you are looking for an accounting company, check out the best business incorporation consultant in Singapore today!